Komplete 6 contains all the new NI releases. PRESS RELEASE: Native Instruments today announced KOMPLETE 6, the latest version of its popular software bundle that has become a mainstay with professional musicians and producers. The new collection offers a veritable arsenal of acclaimed instruments and effects that cover all areas of modern music production, including powerful new versions of ABSYNTH, GUITAR RIG and KONTAKT, at a significantly reduced price point. KOMPLETE 6 incorporates the latest ABSYNTH 5, KONTAKT 4 and GUITAR RIG 4 PRO versions, which add significant creative capabilities over their predecessors, complemented by BATTERY 3, FM8, MASSIVE and REAKTOR 5. All included products offer comprehensive compatibility for current host software versions and operating systems. ELEKTRIK PIANO is now included within the new KONTAKT factory library, while AKOUSTIK PIANO, B4 II and PRO-53 are no longer part of the bundle due to their discontinuation as individual products. Overall, KOMPLETE 6 includes an assortment of 7,000 individual preset sounds based on 60 GByte of premium sample material. 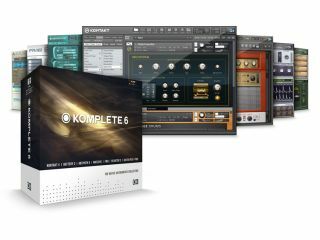 KOMPLETE 6 will be available in October 2009 for a suggested retail price of £412/$559/499 EUR. An update for owners of KOMPLETE 2/3/4/5 will be available for £123/$169/149 EUR. Furthermore, Native Instruments will offer a special time-limited upgrade for owners of any version of KONTAKT or REAKTOR. These users will be able to purchase KOMPLETE 6 at a special price of $339 / 299 EUR until December 31st 2009.